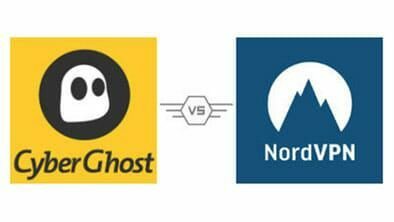 CyberGhost vs NordVPN Comparison - Who Wins? Choosing a VPN service to secure your identity online can be difficult with such a wide selection of services available on the market. This time, we have CyberGhost and NordVPN fighting for the title of the best VPN provider. Keep reading to see who wins! We spend more time online than ever before, posting on social media and even sharing our sensitive data on a variety of websites. As our world digitizes, the threats and risks that exist also continue to evolve, posing greater challenges when working to protect our identities. Virtual Private Networks, or VPNs, give users a safe way to navigate the internet. They also give users freedom of movement, letting them access geo-restricted content and services from anywhere in the world. Our tech experts have decided to conduct a VPN comparison to find the top provider, and today we’re examining CyberGhost and NordVPN, two highly rated services that offer an intriguing combination of features. Read on to see who takes the crown! Our experts take an in-depth look at every VPN service we choose and compare them on a variety of factors. We examine their performance, their key features, as well as their security. We also know that pricing is an important consideration when users compare VPN providers, so we offer a breakdown of their pricing. Our winners are selected based on how they perform across these metrics. VPNs offer the ability to access geo-restricted content and to skirt restrictive censorship laws. To do this, they provide server locations through which users can route their activities. More servers give users better access and improve their overall connection speed. CyberGhost claims over 1,000 servers in 30 countries, whereas NordVPN offers +2,600 servers in over 50 countries. We were pleased to find that both offer unlimited bandwidth, which is vital when streaming online content. Moreover, both include multiple simultaneous connections—5 with CyberGhost and 6 with NordVPN—and each is available on iOS, Android, Mac, and Windows platforms, keeping these two brands almost neck and neck. Available Streaming Services: One of the biggest advantages VPNs present is access to geo-restricted streaming services like Netflix, Hulu, and Spotify. Both services excel here, admitting users to a range of content from the above-listed streaming services as well as BBC iPlayer, NBC, ESPN, Amazon Prime, and more. Mobile Apps: With most of our browsing happening on mobile, it’s vital to protect our devices as well. NordVPN and CyberGhost both come standard with apps available on iOS and Android to help protect mobile browsers. Protocols: How a VPN connects to the internet is an important determinant of how secure and private the connection is. Both VPN providers utilize IKEv2 and OpenVPN, which are industry standards for speed and reliability. NordVPN also uses IPsec to further enhance their encryption. No Log Policy: To ensure users’ privacy, companies may guarantee that they do not store any record of their online activities or IP addresses. Each of these rival services submits transparent zero-log policies and do not keep any records of users’ activities. Browser Extension: Most of our online activity happens through a web browser such as Google Chrome or Firefox. CyberGhost and NordVPN each include extensions for the most popular browsers, including Chrome and Firefox. Kill Switch: This function allows you to instantly terminate your connection if it suddenly becomes unsecured. To enhance user safety, both NordVPN and CyberGhost come standard with kill switches. Speed: VPNs can slow down users’ internet connections while active, so finding one that reduces this impact is important. CyberGhost truly shines, reducing speeds by only 23% on average in some tests. NordVPN can have a more pronounced impact on speeds, depending on location, is overall a highly recommended service for speed and streaming uses. Safety and anonymity are a top priority when you compare VPN providers. VPNs are primarily a way to protect your sensitive data and connection when browsing online. NordVPN delivers impressive security features including AES-256 bit encryption with robust hashing, as well as OpenVPN, which is known for its strong security. CyberGhost isn’t far behind here, also providing AES-256 bit encryption. Even better, these services also have strict zero-log policies. While VPNs are reliable and secure, being able to speak with an expert can help with troubleshooting or improving your security. Both CyberGhost and NordVPN support users via email, live chat, and e-form. We found both of their customer support teams were incredibly helpful. Pricing is also a key factor in our VPN service comparison, and both companies are evenly matched. NordVPN offers a 2-year plan for $3.99 per month, a 1-year plan for $6.99 per month, or a monthly $11.95 subscription. Each plan is accompanied by a 30-day money-back guarantee. CyberGhost offers 3 subscriptions tiers. They have a monthly $11.99 subscription, a 2-year plan for $3.50 per month, or a 1-year subscription for $5.99 a month. The company also provides a 30-day money-back guarantee. Usually, when we compare VPN services, we have a clear winner. In this case, however, we found that both competitors were evenly matched all around. Customers who are looking for a faster connection with more flexible subscription options may prefer CyberGhost, which tested highly on our speed component. Those who are seeking a more security-oriented solution may choose NordVPN, which sacrifices some speed for a robust privacy suite and offers an impressive number of servers and locations around the world. There’s no one solution for everyone, as each user’s needs are unique. Let us know if there are two specific brands you’d like us to compare in the comments below! Reads like NordVPN is the clear winner, but maybe that’s just because it would be better for what I would use it for. NordVPN simply rocks. I’ve actually been using it long before this article was ever published but I can attest they have a solid service. I won’t lie, there are times where some servers are a bit laggy, but that is often when I am connected to the first server on their list. I switch to another server in that country (if available) and I’m good. That’s normal with any VPN though. About the only thing I don’t do with it is torrenting and that’s because I have other sources to get my music/programs. I’m confused as to why there isn’t a clear winner here when the article says CyberGhost has a past history of giving customer information to authorities. You said you choose to trust the service, but why? I’d take slower speed over possible jail, no contest! Hi! We understand your confusion, and while we do appreciate our readers’ safety, we also know that different users look for different things in a VPN. Some are more concerned with privacy and ensuring their data security, while others are more preoccupied with accessing geo-restricted content at high speeds. CyberGhost tested very well when accessing geo-restricted content, and has some of the best speeds available in the market, but we understand that for the privacy-oriented, that’s just not enough to go on. However, we do recommend NordVPN if your main concern is your security! Do you think NordVPN’s IPSec is important? What’s the reason other VPN’s don’t use all the encryption tools available? I was thinking about trying a few out but wondering now if its a waste of time and should just go with the one with the most layers of security? What do you think? Hi, and thanks for the great question! IPSec is important for users who value the ability to set their own encryption standards and who prefer customizability for their VPNs. Not all VPN services offer all the encryption tools and protocols available because they may be targeting different audiences. Some providers value speed and access to geo-restricted content over encryption and privacy, and vice versa. If your main concern is your privacy, then you should definitely go with the one that offers more security layers and features. However, if you need a VPN for speed or simply to bypass local restrictions, then there are many other great alternatives! We hope this helps!